Born in Saragossa to a family of the lesser nobility, Bayeu soon began to attend drawing classes in the studio of Juan Andrés de Merclein who later became his father-in-law. In 1752 he met Antonio González Velázquez who came to Saragossa to paint the dome over the Santa Capilla in the Seo. Merclein’s style and approach to colour would be crucial for the subsequent development of Bayeu’s career. He spent a brief period at court in 1758 then settled permanently in Madrid in 1763 following the visit to Saragossa of Antonio Rafael Mengs, whose assistant Bayeu became. He thus participated in the numerous decorative projects, particularly frescoes, which were underway in various royal residences at the time, resulting in his appointment by the monarch as Court Painter in 1767. Alongside court commissions, Bayeu worked in the Basilica del Pilar in Saragossa and in Toledo cathedral. Following Mengs’s departure for Rome in 1777 he took over his responsibilities but still without achieving the position of First Court Painter. In 1788 he was appointed Director of the Academia de Bellas Artes de San Fernando. Bayeu worked tirelessly for many years to the detriment of his health. He died in Madrid in 1795. Within Bayeu’s extremely extensive output, primarily marked by his activities as a fresco painter, drawing plays a leading role. The inventory drawn up after his death includes a vast number of life drawings, academic studies, preparatory series for canvases and other types of drawings. 2 Together they reveal the pre-eminent influence of Mengs on his work and Bayeu can be considered the most faithful adherent to Mengs’s Neo-classical precepts. 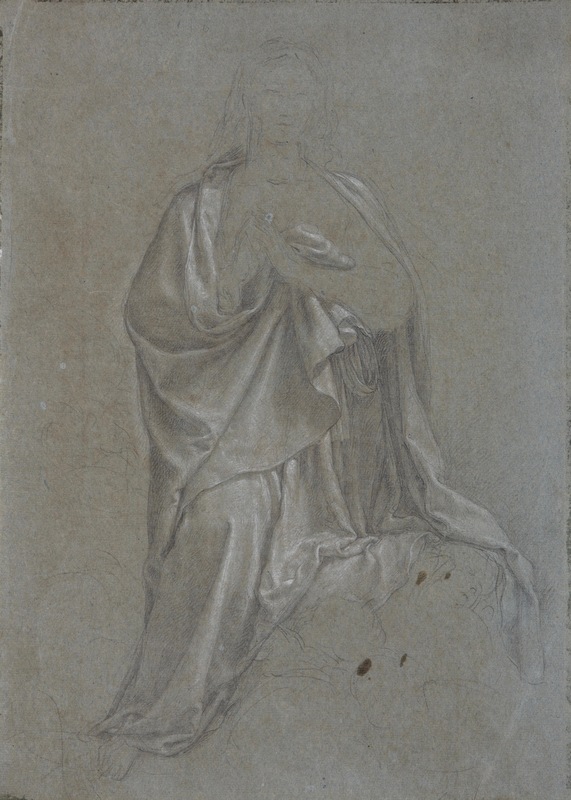 The present drawing is a preparatory study for an Immaculate Conception. 3 It is executed in black chalk on greenish paper with the highlights defined with white chalk, a technique that produces a marked sense of volume. Bayeu’s principal interest here is the creation of the overall volumes, the construction of the pyramidal composition and, above all, the definition of the folds of the mantle, which are notably classical in conception. The figure’s face and hands as well as the cloud supported by angels on which the Virgin stands are only lightly suggested. This working method was habitual with Bayeu and followed Mengs’s teachings. Having decided on the composition he would produce extensive series of partial studies both of the figures and the lesser elements, paying particular attention to the draperies. Bayeu used this drawing for the Immaculate Conception as a preparatory study for the panel on the same subject painted for the Oratory of the small palace known as the Quinta in the grounds of the royal palace at El Pardo (Patrimonio Nacional, 200 x 113 cm, inv. no. 10079292), 4 of around 1780-1785. Bayeu had worked in the palace at El Pardo prior to this date and in 1769 had painted an Immaculate Conception for its Oratory (Patrimonio Nacional, 97.5 x 69.5 cm, inv. no. 10006376), 5 as well as some Mystic Angels and Seraphim for its ceiling. 6 He also painted various frescoes for other rooms in the palace including the Dining Room where he depicted Apollo rewarding the Arts. Bayeu’s Immaculate Conception for the Quinta is one of his most tender and harmonious creations. The solidity of the forms, simplicity of the sculptural folds of the drapery, elegance of the line and judicious disposition of the colours together give rise to a particularly enchanting work. All these elements are highlighted by the soft, gentle form of the Virgin’s face, filled with mystic ecstasy and tenderness. The Immaculate Conception for the Oratory of the Quinta at El Pardo can thus be seen as the evolution of a successful pictorial model first used for the painting on the same subject executed for the palace at El Pardo in 1769. The marked simplicity of the lines and volumes and the direct manner of presenting the image results in an image that immediately moves the viewer. The model is quite different to the type of Virgin popularised by Maella but it can be associated with the figure type invented one generation earlier by artists such as Juan Bautista de la Peña and Antonio Rafael Mengs, from whom Bayeu derived the concept of a simple, classical, natural figure imbued with a gentle beauty that moves the viewer. Ceán Bermúdez, José Agustín, Diccionario histórico de los más ilustres profesores de las Bellas Artes en España. Madrid, Imprenta de la Viuda de Ibarra, 1800, vol. I, p. 100. Many of them have survived to the present day. They are in the Prado (previously in the collection of Pedro González de Sepúlveda), in the Biblioteca Nacional and in the Real Sociedad Económica Aragonesa de Amigos del País. See Pérez Sánchez, Alfonso E., Historia del dibujo en España. De la Edad Media a Goya. Madrid, Cuadernos de Arte Cátedra, 1986, pp. 364-373. Published by De la Mano, José Manuel, Mariano Salvador Maella [1739-1819]. Dibujos. Catálogo razonado. Santander, Fundación Botín, 2011, vol. II, p. 693, fig. 2. Arnáiz, José Manuel, “Sobre Goya y algunos pintores de su entorno” in Anuario del Departamento de Historia y Teoría del Arte, 1999, pp. 265 and 280; and Francisco Bayeu y sus discípulos. Exhibition catalogue, Saragossa, Cajalón, 2007, p. 230. The painting is now in the Royal Palace at Aranjuez. For more information, see: Morales y Marín, José Luis, Los Bayeu. Saragossa, Instituto Camón Aznar, 1979, pp. 57-58, no.18; and Morales y Marín, José Luis, Francisco Bayeu. Vida y obra. Saragossa, Ediciones Moncayo, S.L., 1995, pp. 87-88, no. 47. “He also executed the painting of The Immaculate Conception on the altar of the oratory, and various small angels and heads of seraphim on the ceiling of the same” (Ponz, Antonio, Viaje de España, Madrid, 1772-1794 [Ed. Madrid, Aguilar, 1947, p. 563]); “EL PARDO. PALACIO […] and in the 3rd, which is the oratory, various small angels and seraphim. An Immaculate Conception in oil for the altar” (Ceán Bermúdez, José Agustín, Diccionario histórico de los más ilustres profesores de las Bellas Artes en España. Madrid, Imprenta de la Viuda de Ibarra, 1800, vol. I, p. 102); and Zapater y Gómez, Francisco, Apuntes histórico-biográficos acerca de la Escuela Aragonesa de pintura. Madrid, Establecimiento tipográfico de T. Fortanent, 1863, p. 31. There is a preparatory drawing for the latter in the Museo Nacional del Prado, which is very similar to the present sheet. It is reproduced and discussed in Francisco Bayeu (1734-1779). Exhibition catalogue, Saragossa, Centro de Exposiciones y Congresos-Instituto Camón Aznar, 1996, p. 229, no. cat. 61.